Last week the summer season officially began. This changing of seasons has prompted me to think about several things. One, life keeps moving on. Two, we are not alone. Every time I walk up to our church property and enter into our historic facility, I’m reminded of the thousands of people over the past nearly two centuries who contributed to what FBCD is today. Using the language of the writer of Hebrews above, we are surrounded by so great a cloud of witnesses. Within our Christian tradition, President Roosevelt’s words remind me too of the revolutionist whose words and actions we seek to emulate today. Jesus showed us the way of love. The way of love seems like it ought be an easy way to go. Sadly, the human story reminds us that the love’s way isn’t often the way chosen by many. As we celebrate this coming week, may we not forget that the love of God is for all people...immigrants, refugees, the poor, and EVERYone. I trust that 1373 Grant Street will continue to be a place that embodies our mission statement: First Baptist Church of Denver is a welcoming and affirming, inclusive Christian community that embraces diversity, engages personal faith, and serves with compassion. Enjoy this holiday weekend. Be safe. Plan to attend our 10:30 service on Sunday. Invite someone to join you. They’ll be glad you did. This coming weekend we will celebrate Pentecost Sunday. Traditionally, this is considered the birthday of the Christian Church. In celebrative fashion our choir and musicians will offer their gifts of music. The Spirit will move among us as Scott Pegues offers his first public sermon. 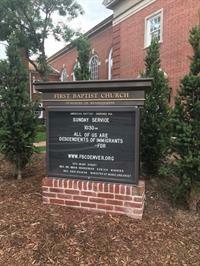 And...Jeanette Vizguerra and members of First Unitarian Society’s Social Justice Committee and the Metro Denver Sanctuary Coalition will be in worship with us expressing their appreciation for FBCD’s support of the sanctuary movement. We can anticipate a Sunday service filled with energy and inspiration. Will you plan now to invite folk to join you in your pew at 10:30? They’ll be glad you did.